It comes as no surpise that mobile has completely disrupted the food and restaurant industry. 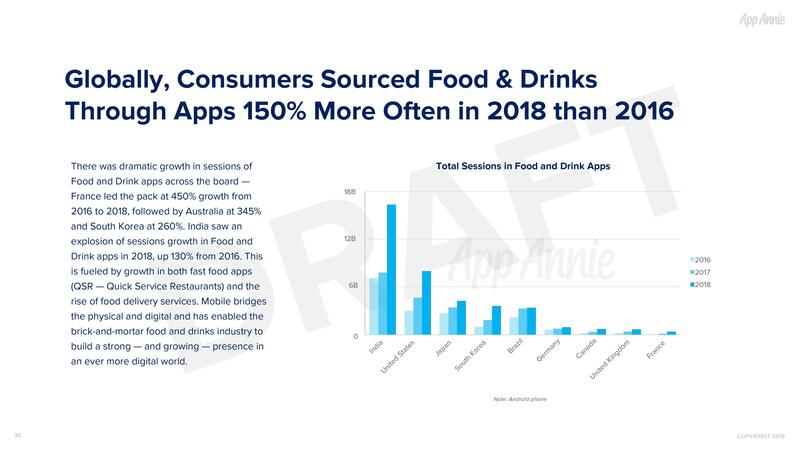 In fact, according to App Annie’s latest data, in 2018 consumers sourced food and drinks through apps 150 percent more often than in 2016. Furthermore, worldwide downloads of the top five food delivery apps have grown 65 percent in 2018 vs. 2016, with UberEATS and Zomato taking the lead. Globally, consumers sourced food & drinks through apps 130 percent more often in 2018 than 2016. Of the markets analyzed, India saw the strongest growth at 900 percent. But food delivery apps were also in high demand for western markets like Canada and the US, up 255 percent and 175 percent respectively. 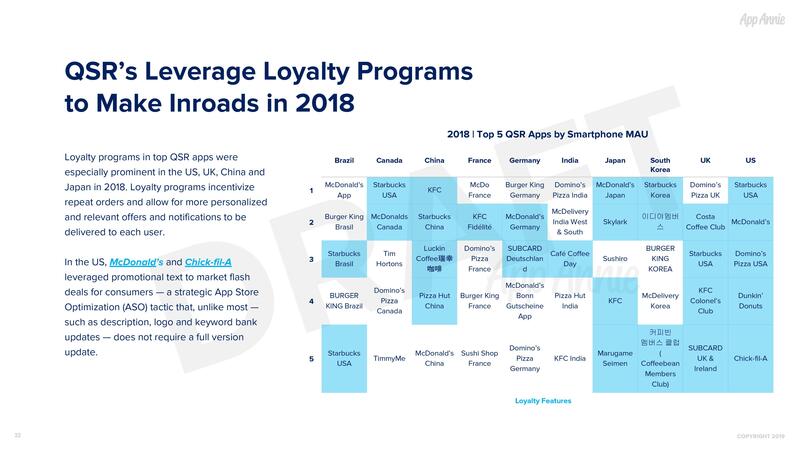 QSR Loyalty Programs: In the US, McDonald’s and Chick-fil-A leveraged promotional text to market flash deals for consumers — a strategic App Store Optimization (ASO) tactic that, unlike most — such as description, logo and keyword bank updates — does not require a full version update. McDonald’s UK overhauled its app experience, including the launch of McDelivery in partnership with UberEATS, and invested heavily in World Cup 2018 promotions to drive adoption. The efforts paid off and the app shot to #10 by smartphone MAU in July 2018, up 10 ranks year-over-year. Burger King leveraged location-based offers within 600-feet of a McDonald’s to unlock a Whopper for 1 cent through its app in December 2018. Mobile offers a treasure trove of data on consumer preferences and can be leveraged for strategic personalized and relevant promotions such as this. These efforts paid off — Burger King hit #1 for daily iPhone downloads of Food and Drink apps in the US on Dec 4, and retained that rank for 9 straight days. Not to mention, the app hit #2 on Dec 5 for overall downloads. This was a significant jump in performance relative to November 2018. To learn more about App Annie's State of Mobile report, click here.